Clad in soft, cream faux leather and edged with a chromed strip, the Hiline Bar Stool Cream is a stunning work of art. And, it easily combines stylish details with modern practicalities. All these features help to make the Hiline an interesting prospect to have in any home. The seat has foam padding to provide high levels of comfort, including the tall, supportive backrest. The cream faux leather exterior is segmented by stitching to add to the visual impact, making the Hiline a desirable stool. 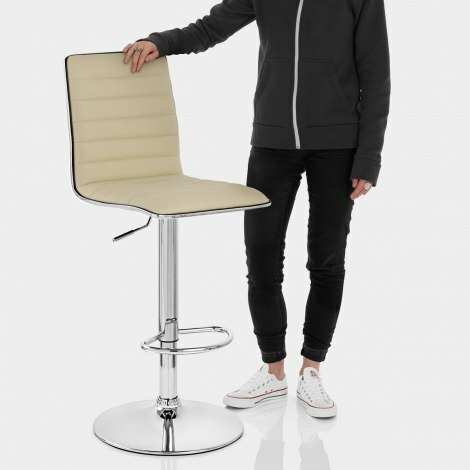 Beneath the seat can be found the gas lift mechanism, which allows you to alter the height of the stool as well as turn through 360 degree, the hand crafted footrest and the base. This base is designed to keep the Hiline very stable and has a rubber ring on the underside designed to help keep your floor perfectly scratch free. "Great value stools, very comfortable"
Ordered on Thursday, arrived on Friday. Easy to assemble due to really clear instructions. Great chair. We ordered 3 of these stools for our kitchen. They arrived well packaged and were very east to put together. They look stunning in our new kitchen and would definitely recommend them. So glad to have found this excellent website. Customer Service was first class and delivery was amazing: I ordered these stools on a Monday and used them at lunch-time on Tuesday! They were straightforward and easy to assemble. We find them very comfortable and they look fabulous. The soft cream colour, chrome finish and slim styling have added an elegant finishing touch to our kitchen. Thank you. Firstly customer service from Atlantic Shopping was excellent and delighted with the stools when they arrived for our new kitchen. Lovely quality, easy to assemble, sleek and look more expensive than the price we paid. Overall an excellent buy quality item and great service from Atlantic. Great stools, excellent quality and easy to put together - would recommend.